Plasma physicist uses electric arcs to replicate the mysterious spherules on the Red Planet. On January 25, 2004, the Mars Rover “Opportunity” landed in a small crater on the Martian plain called Meridiani Planum. A few days later, Opportunity photographed a sight that could alter our ideas about the recent history of the solar system: Scattered around the walls of the crater were BB-sized spherules. Their blue-gray color set them apart from the reddish hue of the iron-rich Martian soil and suggested a name for them—blueberries. The left half of the picture above shows these Martian blueberries at different magnifications. They are embedded in what appears to be fused layers of soil that are exposed on the margins of the crater. As Opportunity rolled further across the Martian landscape, it found a profusion of blueberries. Investigative team members speculated that countless numbers of the spherules lie embedded in the Martian soil. Over time, erosion has exposed large numbers of them and has left many lying on the surface. For many years Electric Universe theorists have proposed that concretions be examined for evidence of formation through electric discharge. In our Picture of the Day for August 27, 2004, Blueberries on Mars, we compared the Martian spherules to hematite concretions from Texas and “Moqui balls” from Utah. We gave several reasons for investigating the possible electrical origins of concretions, geodes, and other mysterious spherical geologic forms. The conventional theories, we noted, are based exclusively on chemistry and mechanics. But there is another phenomenon that produces spheres—electric discharge. In the plasma lab, electric arcs create tiny spheres that are often hollow, such as the hematite concretions seen above. Electric discharge tends to produce spherical layering and a distinct equator and pole, because the electromagnetic force "squeezes" perpendicular to the current that creates it. These characteristics are also found in the "natural" spherules. The Moqui balls pictured here (lower left) have both equatorial bulges and polar markings. Rock-cutters recommend that you will get a better display from a geode if you first locate the equator and poles, then cut across the poles. Even before this Picture of the Day was written, the plasma physicist CJ Ransom, of Vemasat Laboratories, had set up an experiment to test the electrical explanation of concretions and Martian blueberries. He obtained a quantity of hematite and blasted it with an electric arc. The results are seen in the right half of the image above. 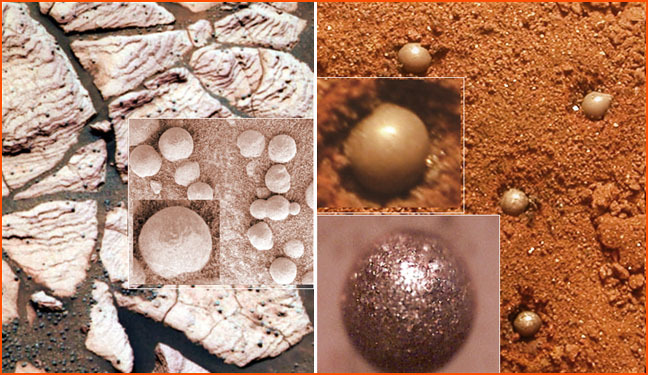 The embedded spheres created by the arc appear to replicate many of the features of the blueberries on Mars. No other laboratory process has achieved a similar result. It should encourage further experiments using higher energies.